TORTOLA-The British Virgin Islands will host the 2nd Organization of Eastern Caribbean States (OECS) Track and Field Championships, July 1-3 at the A. O. Shirley Recreation Grounds and officials are expecting 'top flight competition' from the sub region's athletes. The BVI will host athletes and officials from Anguilla, St. Kitts-Nevis, Antigua and Barbuda, Montserrat, Dominica, St. Lucia, St. Vincent and the Grenadines and Grenada. 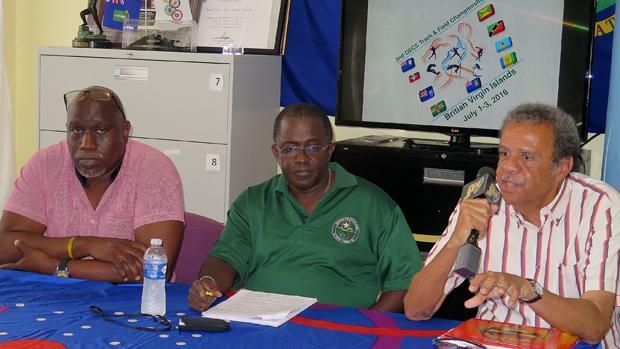 "The BVI Olympic Committee is a part of the Association of Olympic Committees of the OECS (ANOECS) and ANOECS played a key role in getting these championships started," noted BVI Olympic Committee president Ephraim Penn, during a press briefing at the BVI Olympic Committee office. "The decision was made in 2013 when the event was held in St. Kitts, to get things moving in this direction. Our regional Olympic Committees wanted to start national championships in the OECS, so that our up and coming athletes could get exposure to top flight competition, first among themselves, then regionally and internationally. The first one they came up with, with its rich history, is the athletics championships." Although there was an OECS championships from 1987-1991, under the new arrangement with ANOECS, Penn noted the first championship was held in St. Kitts in 2014 and last year's slated for BVI was cancelled because of work planned for the track. He congratulated the BVI Athletics Association for taking up the mantle after the track has been resurfaced to move forward with the championships this year. "I know the athletes in the OECS are looking forward to it, the Olympic Committees in the OECS are looking forward to it and I'm sure the fans will be in for a great treat," Penn stated. "These are the athletes you will see later in August competing in the Olympic Games, so you'll get a first glance of some of the top athletes in the OECS who will be in Rio. From discussing the event with other Olympic Committees, we get a sense that they are fully supporting their Athletic Associations and they will be funding them sufficiently to be here, so we expect big crowds and top flight competition. I'm encouraging fans to come out and see track and field at a very high level and enjoy the warm up for Rio." Former BVI Olympic Committee president and BVI Athletics Association founding member and longest serving president Rey O'Neal, an OECS Congress member, said what was great about the previous OECS Championships, is that outside of the Carifta Games and to a much lesser extend the biannual CAC Jr. Championships, there were very few opportunities for athletes from the small islands to compete. There were a number of athletes at the time who still wanted to compete but, were not at a level where they would go to the CAC Sr. Championships, and the OECS meet gave them a chance to develop at their own pace. "It was possibly the best development meet that could have been made available," he noted. "There hasn't been a whole lot for developing athletes outside the 20 and under age group. It was good to see the OECS Championships come back on stream. We are on the right track and I think it will be an excellent meet." Regarding athletes in this year's competition, O'Neal, a member of the Association of Track and Field Statisticians, said Antigua and Barbuda's Men's 4x100m Relay team a Pan Am Games and 2015 IAAF World Championships finalist as well as their sprinters will be here. He noted the Grenada has a formidable 4x400m relay quartet-though he's not sure if everyone will make it-but they currently have to two fastest quarter milers in the world in Kirani James and Bralon Taplin. The field events will be stronger than they have ever been and Grenada has a tradition for Javelin Throwers. O'Neal noted that the BVI's Eldred Henry and Dominica's Dillon Simon are two Shot Putters who have been throwing distances un thought of several years ago. The St. Lucian pair of High Jumpers, Laverne Spencer and Jeannelle Scheper-ranked in the top 20 in the world last year-and Antigua and Barbuda's Priscilla Frederick, will lead a qualify field. "On the track, the sprints are obviously going to be strong and St. Kitts-Nevis and Antigua and Barbuda, figure to be the leaders. While Grenada has several top 400m runners, there are several others we expect to see here and we have a few one lappers of qualify as well, but, there's going to be a lot of good competition," he said. "We anticipate a number of our All Comers Records falling." The BVI's Tahesia Harrigan-Scott and Chantel Malone are the reigning OECS 100m and Long Jump champions O'Neal noted and the both of the territory's female relay teams should do well, with the 4x100m team running 44.05 seconds last week in Florida. "We really think the crowd will enjoy what they see and there will be competition at a high level," O'Neal said.